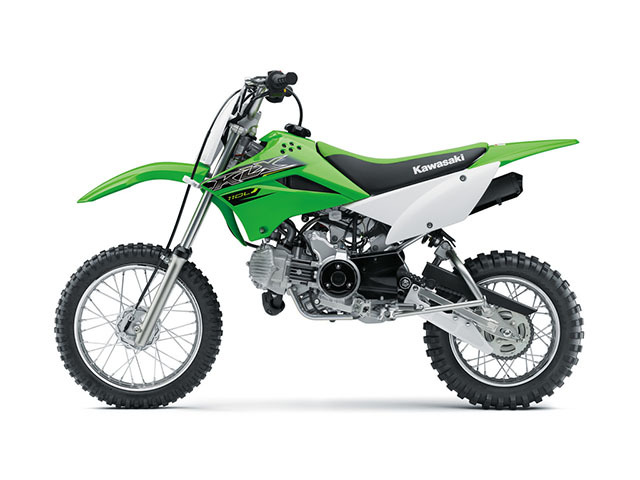 Designed for young mini-moto enthusiasts, the KLX110L can handle rider weights up to 70 kg. 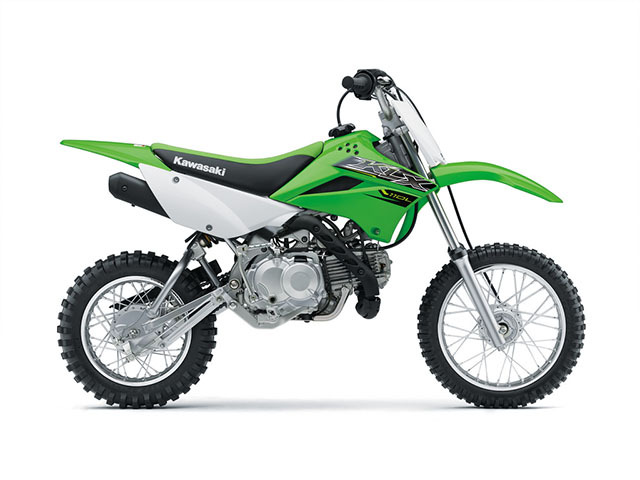 The KLX110L is pure fun to ride for young riders. The 112 cm3 SOHC single cylinder engine's settings results in easy to manage engine power. A 4-speed transmission and manual clutch is easy to operate. 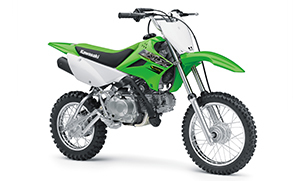 The rear suspension offers great performance and rider comfort. KLX110L's ergonomics accommodate a wider range of riders. Low 730 mm seat height to suit a wide range of riders. Air-cooled, single cylinder engine is simple to operate and maintain, with high reliability. Optimum camshaft timing results in superb engine power at all engine speeds. The piston rings are designed with low tension reducing cylinder friction and mechanical losses and contributes to increased performance throughout the engine speed range. The KLX110L engine is fitted with a high quality replacable oil filter for a longer engine life. With 4 gears, the gear ratios are selected to enhance the engine's acceleration capabilities. Low first gear enhances accelleration from a standing start. Shift drum cam groove and postioning spring design combine with the smooth cam surface resulting in smooth shift feel and positive gear engagement under all riding conditions. Shift lever shape helps prevent unintended actuation. A keyless On/Off switch located on the left handlebar makes starting the KLX110L quick and easy. A red LED warning light on the left handle bar is activated when the handlebar "On/Off" switch is in the "On" position. KACR (Kawasaki Automatic Compression Release) on the intake valve provides easy starting for both the electric and kick starters. Digital CDI ignition ensures quick, reliable starting. The KLX110L offers a manual clutch which makes it easier to squeeze maximum performance out of the powerful little engine. The 30mm forks up front offer plenty of travel while revised spring rates and damping settings specific for the KLX110L allow increased rider weight limits. The lightweight chassis uses a backbone tube frame of high-tensile steel tubing and a braced mono-shock swingarm. 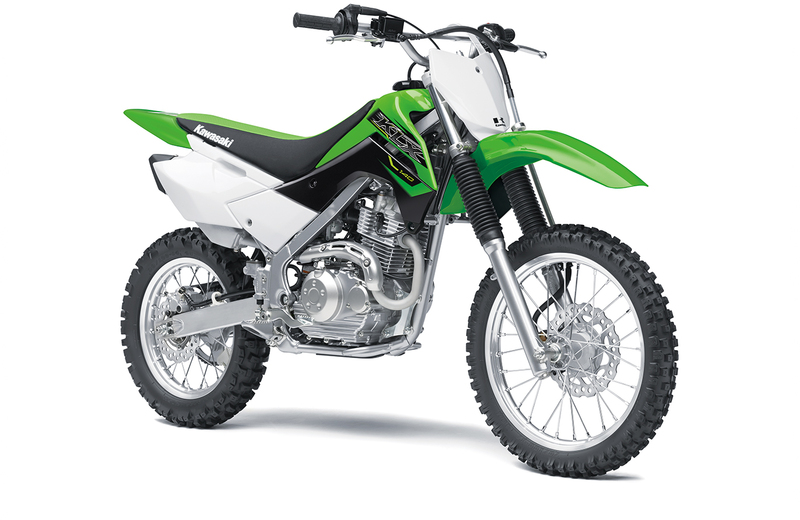 The longer suspension of the KLX110L also offers increased handling performance and increased rough-road capability. The KLX110L with 140 mm front wheel travel and 132 mm rear wheel travel is ready for fun. Factory styling gives the KLX110L the look of a true motocrossers. 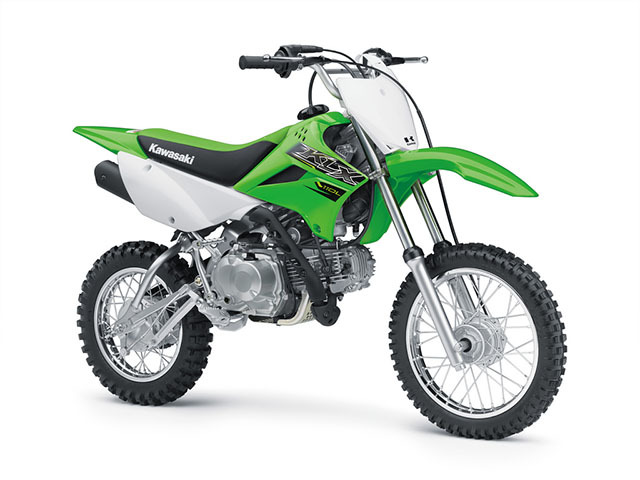 The little KLX's sporty motocross-style looks is enhanced by the shrouds, tank, number plate, side covers and fenders that are modelled after our flagship KX450F motocrosser.